THE GRACEFUL LINES OF THE FAMOUS OCEAN GREYHOUND, the Cunard liner Mauretania, are still remembered by many transatlantic travellers, and by inhabitants of Southampton and the neighbouring coasts. A quadruple-screw liner of 31,938 tons gross, the Mauretania was built at Swan, Hunter and Wigham Richardson’s yard on the River Tyne, and launched on September 20, 1906. She was propelled by four Parsons steam turbines of 68,000 shaft horse-power. THE establishment of faster runs on the Atlantic crossing has always proved a difficult problem - for a variety of reasons. Among the chief of them is that to add even one knot to a ship’s speed it is necessary to augment the engine power by an amount quite disproportionate to the increase in speed. Financial and political considerations also have to be taken into account and new difficulties have to be faced in connexion with the building of a ship large enough to accommodate the necessarily more powerful machinery. All these problems, and more, were presented to the men responsible for one of the most remarkable ships of all time, the Mauretania, holder of the Atlantic record for more than twenty years and the sister of the Lusitania. In 1897 the Blue Riband of the Atlantic had been won by a fine North German Lloyd steamer, the Kaiser Wilhelm der Grosse, of 14,350 tons gross, with 32,000-horse-power engines that gave a speed of over 22 knots. This was a speed that would take some beating, and the challenge came at a bad time in the history of British shipping. Public concern at the position was increasing. The Etruria, last of the Cunarders to be built with a single screw, broke her propeller shaft in mid-Atlantic, and for ten days was on tow to the Azores. The Cunard Company chartered another steamer to carry passengers and mails to their destination, but again public opinion was incensed. The Cunard Company then announced that it would lay down two steamers of 30,000 tons to recapture Great Britain’s position in the Atlantic trade. The building of these two ships was to be carried out with the assistance of the Government on terms that would keep them under the British flag and provide a pair of fast auxiliary cruisers in the event of war. These were the circumstances that governed the building of two of the most famous of all ships - the Lusitania, whose end stirred the whole English-speaking world to arms, and the Mauretania, the ship that was destined to survive storms and war and to add much to the glory of Great Britain’s Mercantile Marine. The agreement between the Cunard Company and the Government was reached in July 1903, and for two years plans were discussed, rejected and re-drafted for ships that were to be the largest and fastest in the world. Admiralty requirements had to be satisfied in the matter of possible conversion for service as auxiliary cruisers. Accordingly a large number of experiments were carried out with models in the Government testing tanks. The models were one-forty-eighth full size, and much valuable information was obtained from them. The shipbuilders, however, required even more particulars on which to base the design of the Mauretania, and a wooden launch was built to a scale of one-sixteenth full size. This launch was run up and down the Northumberland Dock, on the River Tyne, and carried out hundreds of valuable experiments over a period of two years. Then there was the all-important question of the type of machinery to be installed. The steam turbine at the beginning of the twentieth century was still in its infancy, but marine engineers had already prophesied that the new arrival would go far. Their opinion was justified; but at that period to equip the world’s largest ship with a comparatively new type of machinery needed considerable enterprise and courage. Another innovation that was suggested but not adopted until many years afterwards was the use of oil fuel for firing the boilers. In the early years of the century, supplies of fuel oil could not be regarded as absolutely reliable, and its cost was high. The ultimate supremacy of oil firing was, however, foreseen and the bunkers and furnaces in the Mauretania were so built that conversion to liquid fuel was possible without undue difficulty. For months the preparatory work went forward. Every aspect of the work was discussed and agreed upon by committees of experts. The city of Liverpool also took a hand in preparing for the new Cunarders, and nearly 250,000 tons of material were dredged from the bed of the River Mersey alongside the famous Princes Landing Stage. New moorings were also provided in the Mersey. Finally, on September 20, 1906, the Dowager Duchess of Roxburghe broke the traditional bottle of champagne on the stem of the giant vessel and the hull slid into the waters of the Tyne. The Mauretania was built by Swan, Hunter and Wigham Richardson, and was fitted with Parsons steam turbines. The gross tonnage of the Mauretania was 31,938. Her overall length was 790 feet, her beam 88 feet, moulded depth 60 ft 6-in and draught 36 ft 3-in. The length of the promenade deck was 452 feet, and the boat deck was 584 feet long. There were seven decks amidships and two orlop decks fore and aft. The hull was subdivided into 175 watertight compartments in addition to the protection afforded by the cellular double bottom extending to above the bilge keels. There were fifteen watertight bulkheads, and of the watertight doors thirty-eight could be closed from the bridge. The designed speed of the ship was 25 knots, but this was greatly exceeded on many occasions in her long life. The turbine machinery of 68,000 shaft horse-power, was coupled direct to the four propeller shafts. Two high-pressure turbines drove the two out board shafts and two low-pressure turbines drove the inboard shafts, to each of which a reverse turbine was connected for going astern. Steam was supplied by twenty-three double-ended and two single-ended boilers working at a pressure of 195 lb per sq in. The total heating surface of the boilers was 159,000 sq ft, the grate area 4,060 sq ft and there were 192 furnaces into which the “black squad” were required to shovel 1,000 tons of coal a day. The bunker capacity was 6,000 tons, enough for one Atlantic crossing with an allowance for bad weather. 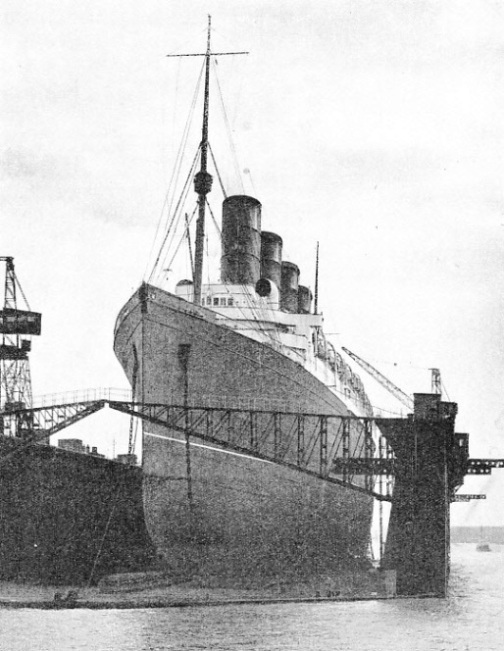 The Mauretania was converted to oil-firing in 1921. Turning from the technical to the human aspect of this wonderful ship we find that her passenger accommodation makes a good showing even when compared with ships built more than a quarter of a century later. When first commissioned the Mauretania carried 563 first-class, 464 second- and 1,138 third-class passengers, in addition to a crew of 938 officers and men. Thirteen months after her launch the completed Mauretania was scheduled for her steam trials, but as she was so much a “vast experiment” her builders indulged in yet another departure from routine. Five days before she was due for the all-important official trials her engineers took her out into the North Sea. The builders wanted to make sure. With the world’s largest ship and engines of a type promising but not fully proven, they wanted to have a little private rehearsal. Willing hands fed those roaring furnaces, and the four giant turbines hummed in harmony as the stem of the great ship clove the seas at speed for the first time. Faster and faster the quadruple screws drove the huge vessel, at a speed never before attained by an ocean liner. And then the telegraph rang in the engine-room “Reduce speed”. Was the huge hull distorting under the enormous strain? No, the captain merely intimated that he was being shaken off his bridge. A redistribution of weight cured that trouble for all time, and on October 22, 1907, the Mauretania left the Tyne for her official trials, which began on November 5, after Scotland had been rounded. Day and night, steaming continuously through wind and rain, the new Cunarder covered 1,216 miles at an average speed of 26.04 knots. Part of that run was accomplished at a speed of 27.36 knots. Then followed other speed and turning tests with highly satisfactory results. With rudder hard over and all turbines full ahead, the turning circle was only three and three-quarter lengths. In the years that followed a quick turn was to save her from the death-dealing blow of a torpedo, which would have struck below the water-line. Eleven days after her final trials the Mauretania left Liverpool on her maiden voyage to New York. The official timing of that voyage was: “Length of ocean passage, 5 days 5 hours 10 minutes. Average speed, 22.21 knots.” In the preceding September the Lusitania had already run her maiden voyage to New York at an average speed of 23.01 knots, with a return voyage at 23.993 knots. The Blue Riband had been regained for Great Britain. CONVERTED INTO A HOSPITAL SHIP during the war of 1914-18, the Mauretania made three voyages between Southampton and the island of Lemnos, in the Aegean Sea. Her public rooms were turned into hospital wards and she carried 2,307 medical staff and 6,298 sick and wounded. No immediate record was achieved, however, by the Mauretania, and with good reason. At 7.30 in the evening of Saturday, November 16, 1907, the liner left Princes Landing Stage. Liverpool, and there followed a wonderfully smooth passage through the night to Queenstown (now Cobh), Ireland, reached at nine o’clock on Sunday morning. Two hours later, with additional passengers and mails on board, the Mauretania faced the might of the Atlantic Ocean for the first time. For just one hour on that wintry Sunday the great ship gave a demonstration of her speed and then she met the weather and drove through it. Those were the days when stokeholds were infernos of blinding coal-dust, choking fumes and blistering heat. No wonder the feats of endurance performed by the“black squad” have been eulogized in picture and verse. Liverpool Irish were the boiler-room staff in the Mauretania - tough men for one of the toughest jobs in the world. Four hours at a time was a shift, and every man worked two shifts every twenty-four hours. Trimmers plied pick and shovel in the almost unbreathable atmosphere of the bunkers - eyes, nostrils, mouth and lungs everlastingly sprayed with close-clinging coal-dust, wheeling barrow loads of coal to the firing fiats ready for the stokers’ shovels. Imagine the task of just one man - feeding 5 tons of coal into a white hot furnace, each and every day. Shifts were timed by gong, prize-fight fashion, with seven-minute rounds. Seven furious minutes shooting black coal into white flame. The crash of a gong, a brief pause for breath, another gong. Then another seven minutes and the long slicers snaked in and out of furnace mouths clearing the fires of deadening clinker. the Mauretania began her wrestle with the Atlantic rollers and by noon of the following day she had covered 571 miles of her maiden voyage. The struggle with the ocean then entered an even fiercer phase. Great seas broke over the bows, and to the man in the crow’s nest aloft the great ship appeared dimly outlined below in a smother of spray, dwarfed by the gigantic seas, only the four funnel tops appearing as islands in a world of water. Picture the great stem lifting clear upwards a full 60 feet to be buried into the next mountainous sea by the mighty thrust of those giant turbines drawing hungrily on a roaring volcano of steam from battery upon battery of boilers in the depths of the great hull. As the seas crashed on bulwark and plating the roaring avalanches of water tore at everything in their path. A spare anchor, a trifle of only 10 tons, was wrenched free from the forecastle head and began to beat a devil’s tattoo on the deck below it. But this was no joking matter - the smashing drive of pointed anchor flukes with 10 tons of anchor behind them was a deadly peril. Slowly the Mauretania turned off her course to give shelter, scant enough to the men who fought that anchor to a standstill and lashed it down. THE GREAT CUNARDER’S LAST VOYAGE. 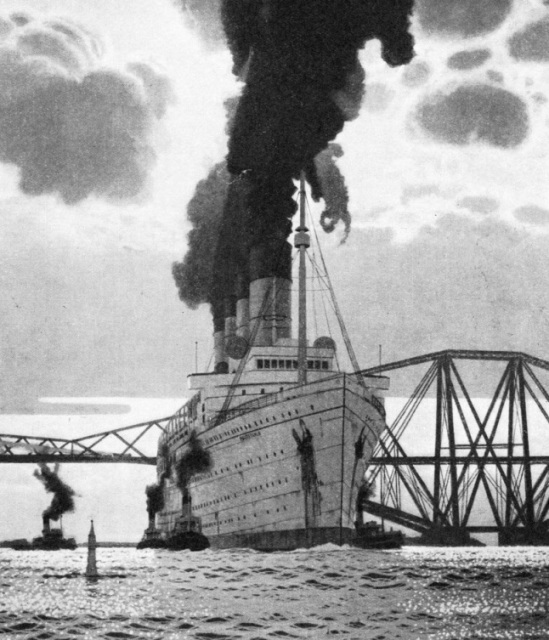 This striking impression of the Mauretania, passing the Forth Bridge on her way to Rosyth to be broken up, is reproduced from the painting by Charles Pears, R.O.I. The original painting is in the Queen Mary, the vessel which carries on the fine tradition established by the Mauretania. 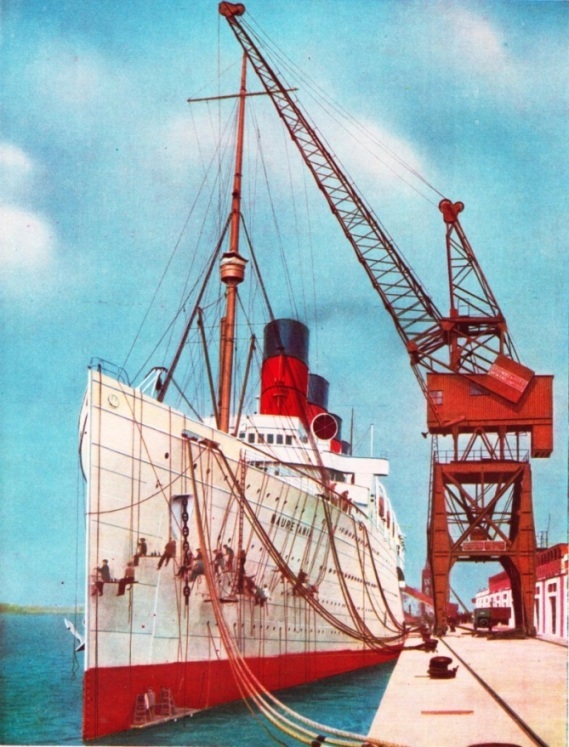 The well-beloved Mauretania left Southampton on her last voyage on July 1, 1934, for Rosyth. On Tuesday at noon the log showed a run of 464 nautical miles for the twenty-four hours. On Wednesday, with improved weather, the run was 563 miles. On Thursday at noon the mileage stood at 624, a day’s record and six more miles than the Lusitania’s best for a similar period. On Friday, November 22, 1907, the Mauretania passed Sandy Hook. At 11.13 pm the liner anchored in thick fog. A deputation of influential passengers - business men in a hurry for Wall Street - waited on the ship’s commander, Captain John Pritchard. Would he not proceed through the fog and dock? The captain could not and would not risk a river collision and said so. Before discussion could grow cold the fog lifted and at 6.15 pm the Mauretania docked in New York. After a brief stay among the skyscrapers the ship turned about for England. She left New York for Liverpool at 1.35 pm on Saturday, November 30, and arrived in the Mersey after a run of 5 days 10 hours 50 minutes, at an average speed of 23.69 knots. The time on the ocean portion of the return passage was only 4 days 22 hours 29 minutes, and that despite fog and bad weather. One more Atlantic round voyage she made in 1907 at much the same average speeds, and then began a wonderful series of journeys during which the liner kept time with marvellous regularity. The Mauretania was a hard-worked ship, and little time was allowed her for resting between voyages. Coaling was a lengthy and horribly dirty proceeding, and no light task was involved in replenishing stores. Repaintings, renewals and the repair of storm damage all took toll of her working time. But despite delays the ship made twelve round voyages in 1908. In that year she won from the Lusitania the Blue Riband of the Atlantic, and for more than twenty years she remained the fastest liner in the world. She encountered her first taste of propeller trouble in May 1908, when bound for New York. One of the propellers hit submerged wreckage and a blade was torn off. With three good propellers she completed that voyage and, still in that condition, made eight more round voyages at a speed approaching her average, except for one eastward passage, which was made at only 18.72 knots. In October 1908 the Mauretania was taken out of commission for her annual overhaul, and in the following January she set out for New York with a set of new propellers, four-bladed and cast in one piece in accordance with marine practice still in vogue. The original propellers had blades bolted on to a boss. On that January voyage westward the average speed was 23.71 knots, but on the return journey the speed rose to an average of over 25 knots, and at that level it stayed for months on end. For the next three years the Mauretania ran to and fro across the Atlantic, with only a short break for her usual annual overhaul. During that period she made eighty-eight crossings, and of these seventy were runs at an average speed of over 25 knots. Of the forty-four round voyages (Liverpool to Liverpool) no fewer than thirty-five were each completed in seventeen days, with four days in port for the “turn-round”. This was a fine performance, but in addition to the high average speeds there were many instances of exceptional steaming. September in 1909 and 1910 saw westward runs at an average of 26.06 knots. In March 1910 and May 1911 the ship registered a top speed of 27 knots. Nineteen years later she was destined to average that speed for a whole Atlantic crossing. So the Mauretania earned an unsurpassed reputation for speed and reliability. For two more years she continued to carry emigrants from Europe to the New World, business men, celebrities and tourists on their several errands. On August 1, 1914, the Mauretania sailed from Liverpool on her westward voyage. Four days later she received wireless instructions to make with all speed for Halifax, Nova Scotia. Great Britain had declared war on Germany. The Mauretania had been specially built to permit the mounting of 6-in guns for service as an auxiliary cruiser in time of war. She continued, however, to serve the Atlantic route until October, when she was requisitioned by the Government in accordance with the Cunard Company’s undertaking. The Mauretania, however, was never used as an auxiliary cruiser. The use of large armed merchantmen as war vessels had been proved to be a mistake. The proof had rested largely in the fate of a German auxiliary - the famous Kaiser Wilhelm der Grosse, crack liner of the Atlantic in 1897. She was caught in August 1914, when coaling off Rio de Oro, on the west coast of Africa. The hunter was HMS Highflyer, an obsolete cruiser with but a tithe of the liner’s speed. After a short but sharp action the Kaiser Wilhelm der Grosse was sunk in shallow water. It is true that the German ship had met with some success as a commerce raider, but the difficulties of coaling remained and, in any event, auxiliaries were never a match for regular warships. The Mauretania was accordingly laid up until with the opening of the Dardanelles campaign an opportunity was found to use her. In May 1915 the Mauretania made her first voyage as a transport from Southampton, with 3,182 troops on board, bound for the Allied base of Mudros, on the island of Lemnos, in the Aegean Sea. On May 7, 1915, her sister ship, the Lusitania, carrying passengers across the Atlantic to England, was torpedoed off the Old Head of Kinsale and sunk with the loss of 1,198 men, women and children. By August 1915 the Mauretania had made three voyages to Mudros, carrying 10,391 officers and men. It was in the Medit-erranean that the Mauretania came within a narrow margin of sharing the fate of her sister ship. The commander of the Mauretania, Captain Dow, saw the track of an approaching torpedo on the starboard bow. Instantly the wheel was spun hard a-port. The torpedo missed by the narrow margin of about 5 feet. Calmness and quick thinking on the bridge were allied to grim courage in the confined spaces below. In engine-room and stoking flat the men stood to their jobs, crowding on all revolutions to stave off the peril that threatened all on board. Next followed yet another transformation for the world’s fastest liner. She was equipped as a hospital ship. Public rooms were turned into hospital wards packed with swing cots, and promenade and shelter decks were used as well. Three voyages the Mauretania made to Mudros and back, carrying 2,307 medical staff and 6,298 sick and wounded. With the evacuation of the Gallipoli peninsula the ship was paid off and her hospital equipment removed. Once again the Cunarder became a transport, and in October and November 1916 she made two voyages from Halifax, Nova Scotia, to Liverpool, carrying 6,000 officers and men as part of Canada’s contribution to the struggle on the Somme. ONE OF THE MOST POPULAR TRANSATLANTIC LINERS was the Mauretania, shown being painted at Southampton in preparation for one of the cruises on which she was sometimes employed. A quadruple-screw liner of 31,938 tons gross, the Mauretania had an effective life of twenty-seven years. She and her sister ship the Lusitania were, at the time of their completion, the world’s largest ships, and the installation of turbine propelling machinery was a courageous venture. On her trials the Mauretania covered 1,216 miles at an average speed of 26.04 knots. In 1908 she captured the Blue Riband of the Atlantic and held it for over twenty years. As she grew older her speed increased. She was sold for breaking up in 1934. During the whole of 1917, Great Britain’s blackest year of the war, the Mauretania lay up at Greenock, but early in 1918 she was again commissioned as a transport, this time to bring American troops over to France. The work went on for seven months steadily reinforcing the Western front with divisions from the United States. News of the war’s outbreak had been flashed to the Mauretania on the high seas, and in the same manner she received notification of the Armistice. Thereafter followed a period when the liner’s services were required to return men to their homes, and on May 27, 1919, she was finally paid off and handed back to her owners. Then followed a bad period in the life of the Mauretania. No war veteran, whether man or ship, was in best shape to face post-war conditions. The Mauretania made seven voyages on the Southampton-New York route in 1920, ad ran for only four months in 1921. Her average speed was then only 18.23 knots. Following labour troubles and difficulty in obtaining good coal, the ship’s fortunes were increased in July 1921 by an outbreak of fire that gutted all the first-class cabins on E Deck and damaged the deck above. That fire was a blessing in disguise, for in addition to repairing the damage the Cunard Company decided to convert the liner to an oil-burner at a cost of over £250,000. Her engines were overhauled, and by March 1922 she was back at work. In that year the Mauretania made eleven round voyages across the Atlantic Ocean and twelve more in the year following. Her average speed was beginning to approach pre-war standard again. Early in 1923 she had her first experience of cruising, when for some weeks she was chartered by an American company for a trip to the Mediterranean. Thereafter followed year after year of steady work to and fro across the Atlantic with occasional cruising holidays. In 1926 the interior of the Mauretania received considerable attention. One hundred staterooms were modernized and public rooms were redecorated and refurnished. Two years later her engine-room received attention. This was more than an overhaul; it was little short of a reconstruction. New condensers and pumps were installed, and improvements were made to the turbines. After this most of her voyages were run at an average speed of over 25 knots. IN THE WORLD’S LARGEST FLOATING DOCK, at Southampton, the Mauretania was often overhauled all through her career. The floating dock, which has a lifting power of 60,000 tons, is fully described on page 1050. The Mauretania had an overall length of 790 feet, a beam of 88 feet and a moulded depth of 60 ft 6-in. Her hull was subdivided into 175 watertight compartments, and a cellular double bottom extended above the bilge keels. No queen can reign for ever, and the inevitable young rival was now due to take up the sceptre. In July 1929 the new German liner Bremen made the passage from Cherbourg to the Ambrose Light in 4 days 17 hours 42 minutes at an average speed of 27.9 knots. This was 1½ knots faster than the Mauretania’s best; but the gallant old ship was not to be ousted without a struggle. On August 3, 1929, the Mauretania left Southampton for Cherbourg and New York with orders to do her best. Propeller revolutions varied between 205 and 210 a minute, and the engines were designed to give only 180. She did that voyage at an average speed of 26.9 knots, and her own Atlantic westbound record was broken by five hours. The Bremen had conquered by 4½ hours, but the German had been favoured by the weather. For the Mauretania it was a defeat to be proud of. On the passage home she averaged 27.22 knots, another record voyage. That was in 1929 and still the wonderful old ship had years of useful life ahead of her, fast passages on time with the now popular cruises at intervals. In addition to her war service, the Mauretania made 319 voyages. The last voyage of the famous liner, from Southampton to Rosyth, in the Firth of Forth, began on July 1, 1934. On board the mighty Queen Mary there hangs a fine picture of the Mauretania, depicting her at Rosyth, surrounded by tugs, with the Forth Bridge as a background, and a funeral plume of black smoke rising into clouded sky. 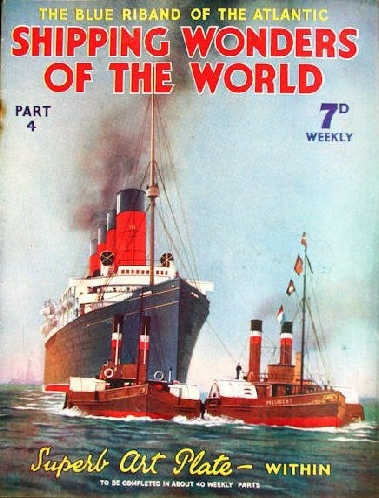 The Mauretania also featured on the covers of Part 4 and Part 19 of Shipping Wonders of the World. The cover of part 19 is the same as the colour plate illustrated above.